It is about kindness, it is about giving others the same amount of love that you want for yourselves, it is about warmth, ethic and a get together season and it is also about making it happen for those who cannot afford to have a fine luxurious living. Black Friday is the day when shops, online stores, markets and big malls open up sales & discount packages so all and sundry could enjoy the Christmas deals on cheaper prices and even the down trodden too can avail the Christmas stuff. Let us know about your plans of Christmas decorations, it is the day of sheer happiness, sharing joys and multiplying them so I hope you too avail the chance and spread happiness. 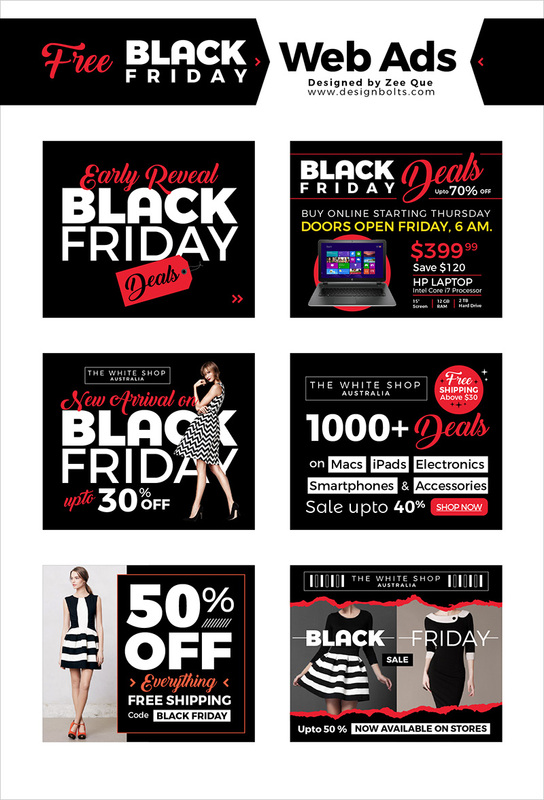 Today my post is bringing forth free Black Friday Deals web Ads in vector format. You can place them on your websites, these will help you a great deal and will also drive good traffic towards your blog. These can be used for personal blogs and also being a designer you can use them up for other websites who offer such big and small deal on Black Friday. Web ads should be funky, blinking, having vibrant fonts so to be noticeable. Stick around for more Christmas posts, we are all decked up with the best Christmas posts for you all, I hope you enjoy the best winter season and all the Christmas happenings.